Home / All About Baseball / An Open Letter to Commissioner Manfred: Reinstate Pete! An Open Letter to Commissioner Manfred: Reinstate Pete! I look at how baseball has evolved over the years and, although I do not consider myself a baseball purist, I believe there has been a plethora of examples on how the game has been tarnished over the past 26 years post-banishment of “Charlie Hustle”. The fact that men who have been implicated and caught taking performance enhancing drugs are still allowed in the game is disgraceful. The fact that the New York Mets and Yankees cannot wear NYPD, NYFD, and Port Authority caps every September 11 is downright atrocious. The 1994 Strike and cancelling of the World Series almost brought down America’s Pastime to its knees. Do not even get me started on how Montreal was screwed out of a stadium and a team, thanks to Jeffrey Loria and former Commissioner Bud Selig. I honestly feel, Commissioner Manfred, that there is a bit of hypocrisy regarding the Pete Rose situation and the actions of Major League Baseball and its integrity. The fact that Mark McGwire and Barry Bonds are allowed coaching positions in baseball after doctoring their bodies with illegal drugs and tarnishing the game in front of Congress and Pete Rose can’t receive partial reinstatement is a damn shame. The fact that Alex Rodriguez led a group of star athletes to Anthony Bosch for PEDs and still finds a way to make every cent of his contract in MLB and NOT get blackballed from the sport is a damn shame. The bottom line is simple: whenever it works in Major League Baseball’s favor, it’s OK. Whenever it helps pad MLB’s pockets (i.e. McGwire and Sammy Sosa’s home run chase in 1998), it’s all good. But when it comes to 26 years later and Pete Rose has sat through a strike and performance enhancing drugs and STILL not get reinstated, it’s a damn shame. Speaking of padding MLB’s pockets, YOU DO BUSINESS WITH GAMBLING BASED WEBSITES! Major League Baseball has signed deals with Draft Kings and Fan Duel to help promote the brand of your company with major financial implications. With New York State trying to brand it as illegal gambling, you are technically in a partnership with them! When betting works in your favor, it’s all fine and good. However, with Pete Rose still barred from MLB activities due to, you know, GAMBLING, it’s so hypocritical it’s not even funny. Christopher “Mad Dog” Russo was spot on with his analysis and it truly is remarkable that nothing more has been made of this. Commissioner Manfred, this game has been built on history. That is what drew me to the sport of baseball. The fact that Pete Rose has not been reinstated yet into Major League Baseball, even on a limited access, so that Cooperstown would allow themselves to place him on the Hall of Fame ballot, is a sad state of affairs. Please, take a look beyond the betting on the sport of baseball and realize that Major League Baseball has been infiltrated with scandals left and right. 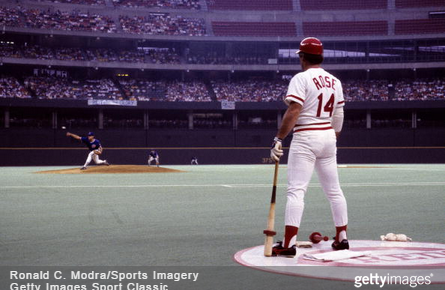 Please allow Pete Rose to come off the banishment list. It would be good for the game. Even “Shoeless” Joe Jackson was allowed to be on a Hall of Fame ballot.